Trying to decide what to do in Greenville, SC in May? Don’t miss out on some of the great shows and free events happening across the greater Greenville area. Here are our picks for the best activities and entertainment available this month! The Fair is coming back to Simpsonville! 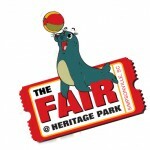 The Fair at Heritage Park will feature carnival staples, local delicacies and a number of new shows. Bring the whole family and enjoy a fun-filled day. Featured performers and shows in this event include Lady Houdini, World of Wonders, Human Cannonball, racing pigs, Eudora Farms, quality arts & crafts fair, and the traveling ‘Sea Lion Splash’ exhibit. Greenville’s biggest downtown open-air festivity of visual arts is happening on May 13-15. This annual event is one of the biggest festivals in downtown Greenville. Aside from music and entertainment, it provides art patrons with an opportunity to celebrate all forms of arts. Local talents will be featured in the event as well as guest performers. 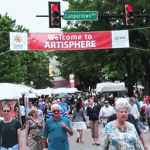 Artisphere is a nationally ranked fine arts festival that brings the community together through the arts. It attracts, entertains, educates, inspires and enriches a diverse audience. 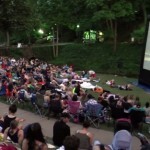 Free Movies!!! Bring your lawn chair and get comfortable. Picnics are also welcome, but please no pets. Movies begin at sunset. There will be food trucks on site, all city events are smoke-free, and adults consuming alcohol will need to purchase a $1 wrist band. Loaves and Fishes, a local organization that fights hunger in the Upstate, brings Taste of the Upstate this year for an evening of charity, music, and Gourmet Cake Walk. In addition, the event also features “tastes” from 10 of Greenville’s best chefs. Greenville restaurants including Bacon Bros. Public House, City Range, JP’s 4 Corners, Passerelle Bistro, Restaurant 17, Smoke on the Water, Stellar Restaurant & Wine Bar, The Melting pot, The Peddler, and Steakhouse will contribute to the event’s culinary bounty. 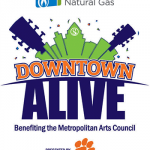 Piedmont Natural Gas Downtown Alive FREE! Happening every Thursday night from 5:30 p.m. until 8:30 p.m, NOMA Square comes alive with live music. The event series is the single largest fundraiser for the Metropolitan Arts Council, a local organization providing support and opportunities for artists, arts organizations, art educators and enthusiast throughout Greenville County. Different performers will be featured each week. NOMA Square turns into a concert ground with live music from rock, blues to funk music.